At first glance, Diego Velázquez's 1656 painting Las Meninas might seem like just another ensemble portrait. But then, your eye snags on some curious detail. Soon you can't look away, locked into uncovering clues that have long fascinated and frustrated art historians. Let's dig into the mystery. At its center is Infanta Margarita Teresa, who would mature into titles like Holy Roman Empress, Archduchess consort of Austria, and Queen consort of Hungary and Bohemia. Her reign lasted from 1666 to 1673, when she died at age 21. Though she'd be the subject of many portraits—including several more from Velázquez—Las Meninas is the most famous. 2. ... But really, it's more of a mash-up. Portraits are traditionally formal, showing their subjects isolated. But here, the Maids of Honour for which the painting is named surround the young princess, as does as band of fellow servants. Las Meninas is a behind-the-scenes look at the Spanish court. This day-in-the-life perspective is often associated with genre painting; through this marriage of setting and subject, Velázquez created a genre-bending masterpiece. 3. The King and Queen are cleverly included. Above the princess's head, you'll notice a dark wooden frame. Within it, two figures can be seen. These are her father and mother, King Philip IV of Spain and Mariana of Austria. 4. Velázquez makes a cameo of his own. Even though he was first painter to the king, it was still a bold move for Velázquez to paint himself into Las Meninas, which turned a royal commission into a self-portrait. But that’s him on the left with brush in hand. Earlier this year, the BBC called this inclusion "the world's first photobomb," even though the painting predated photography by almost 175 years. 5. Only one person in the painting remains unidentified. On top of the king, queen, princess, and painter, the painting features the queen's chamberlain, Don José Nieto Velázquez (possibly related to the painter), who can be spotted on the stairs. The ladies in waiting doting on Margaret Theresa are doña María Agustina Sarmiento de Sotomayor (on the left) and doña Isabel de Velasco (on the right). Over the latter's shoulder peeks doña Marcela de Ulloa, the little princess's appointed chaperone, who converses with a bodyguard whose name is lost to history (but some modern scholars believe it might be Diego Ruiz de Azcona). In the right corner are Maria Barbola and Nicolas Pertusato, who are most often identified as the "dwarfs" at court. The mastiff's name is also unknown. 6. There’s a mystery surrounding what Velázquez is painting. One of the biggest questions about Las Meninas centers on the canvas that faces away from the viewer. Some scholars think the framed image of the king and queen in the background is not a portrait, but a mirror reflecting the royalty standing before the princess and the painter—just out of frame—posing to be immortalized in oil paints. Another theory posits that the royal pair's position is not in line with the gaze of Velázquez, and so they could not be his subject. 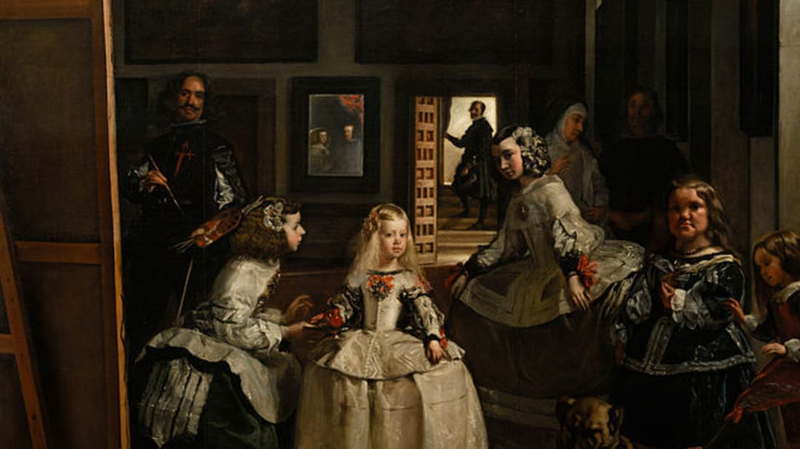 Perhaps this regal couple has joined their daughter in admiring the process of the painter, as Velázquez seems to hope Las Meninas's audience will. Or maybe the princess and the painter are looking at a large mirror, which allows him to depict the girl while her attentive entourage keeps her in good spirits. Whether the king is watching or posing, these theories posit Velázquez intentionally framed the painting so that its audience would be looking from the viewpoint of the royalty reflected in that mirror. Basically, by looking at this painting, you are in the shoes of the 17th century ruler of Spain. 8. ... And not many had the chance to experience that in the king's lifetime. Philip IV kept Las Meninas hanging in his private study, where few outsiders had the pleasure of enjoying its brilliance. 9. The painting was posthumously altered under royal command. While Philip IV had showered Velázquez with honors while the artist lived, the king delivered his most lasting tribute after the painter’s death. In 1660, one year after Velázquez was inducted into the Catholic organization the Order of Santiago, the painter died. In his honor, the king commanded the order's insignia be added to the chest of Velázquez's Las Meninas figure. Some historians even claim it was the king himself who painted on this final touch. Las Meninas measures in at roughly 10.5 feet by 9 feet. 11. Las Meninas went straight from royal hands to the national museum. The Museo de Prado opened in 1819 with the stated purpose of showing the world the value and glory of its nation's art. The museum’s initial collection came straight from the Royal Crown's coffers, and since Velázquez had been the curator of the king's art collection during his life, many of his own works made the cut. Yet Las Meninas is Prado's shining jewel, and, along with Goya’s The Third of May 1808, one of the most famous works in its collection. For this reason, the painting is never loaned out. 12. Its name was changed at some point. The first mention of the painting being called Las Meninas was found in a Museo del Prado 1843 catalogue. In a 1666 inventory, it was referred to as Retrato de la señora emperatriz con sus damas y una enana (Portrait of the Empress with her Ladies and a Dwarf). Then, after a fire in 1734, it was called La familia del Señor rey Phelipe Quarto and was referred to as La Familia until the final name change. 13. Las Meninas made Velázquez famous over 150 years after his death. The investment in El Prado paid off and made Spanish art all the rage in 19th century Europe. It also launched awareness of Velázquez's talents outside of the Spanish court. With his works accessible to the public, Velázquez inspired a new generation of painters including French realist painter Gustave Courbet, Édouard Manet, and American Tonalism founder James Abbott Whistler. 14. The UK has its own version of the painting. The Kingston Lacy Estate in Dorset boasts a smaller version of the painting that’s wrapped in nearly as much mystery as the famed canvas. The mystery hinges on who painted this replica and when. Some scholars have argued that the Dorset painting was the work of Velázquez himself and speculated that the smaller piece may have been a model for the Prado’s iconic treasure. Others argue that the canvas is more likely a slightly later copy by an artist who was uniquely equipped to mimic Velázquez's style: His son-in-law Juan Bautista Martínez del Mazo, who succeeded Velázquez as Spain’s royal painter.